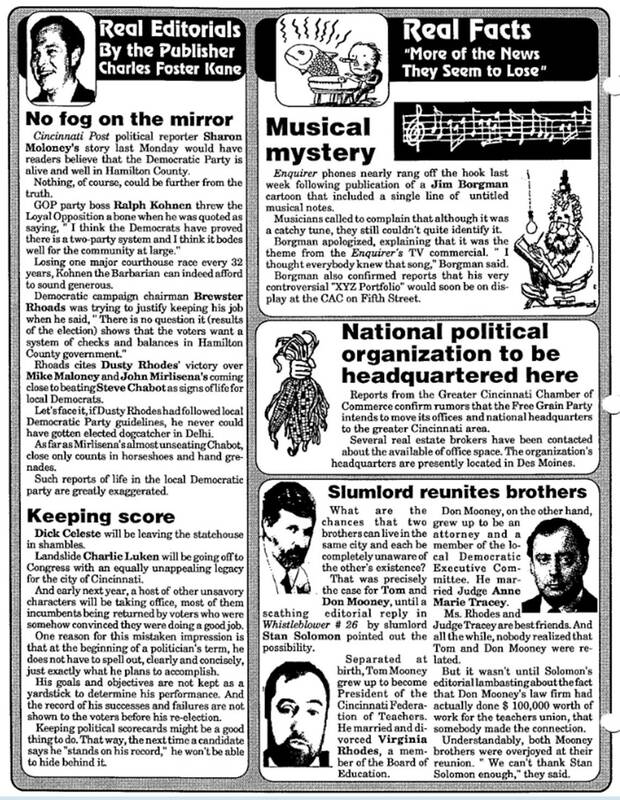 PAGE TWO featured REAL EDITORIALS BY PUBLISHER CHARLES FOSTER KANE (No Fog On The Mirror told about the moribund condition of the local DemocRAT Party). REAL FACTS tried to get tp the bottom of those mysterious musical notes that appeared in one of Jim Borgman’s editorial cartoons. Cincinnati would soon be home to a national political organization when the Free Grain Party moved its national headquarters to the Queen City from Des Moines. 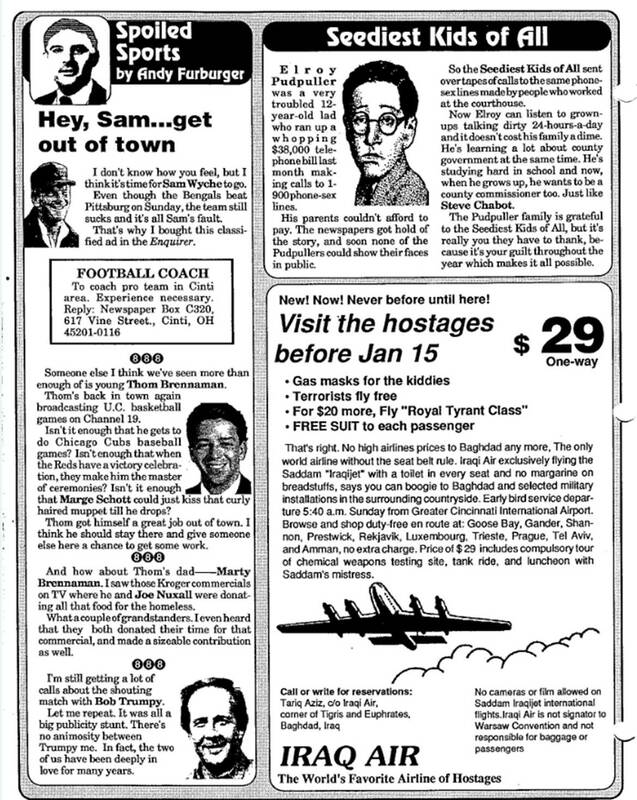 Plus there was a heart-warming item about how Slumlord Stan Solomon had inadvertently reunited Don and Tom Mooney. 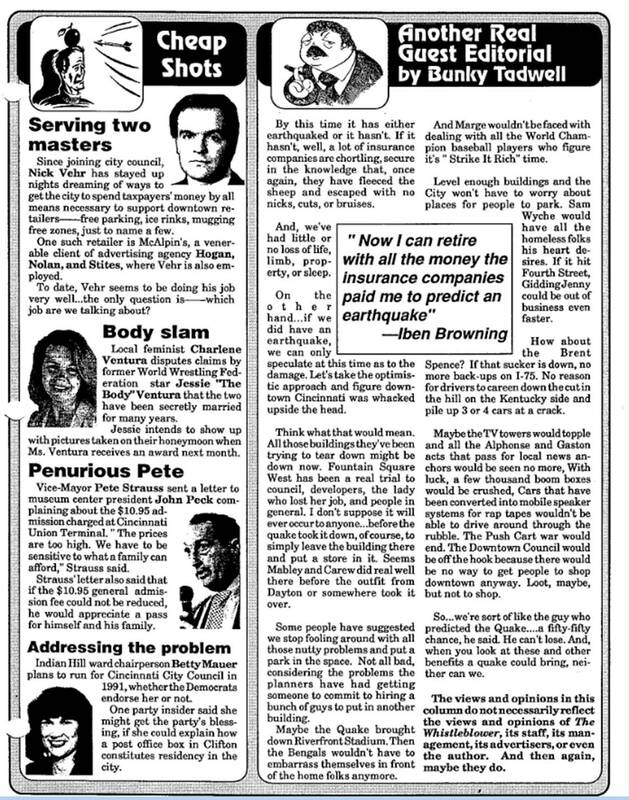 PAGE THREE featured CHEAP SHOTS taken at Nick Vehr, Charlene Ventura, Cincinnati Vice-Mayor Pete Strauss, and Betty Mauer, whoever the hell she was. Bunky Tadwell was complaining about the fact that there was no earthquake in Cincinnati that had been predicted in ANOTHER GUEST EDITORIAL. PAGE FOUR featured the REAL LETTERS FROM REAL SUBSCRIBERS, and during all those years, not a single one of those people has ever called to complain that their letter might not have been real. ANOTHER EXCLUSIVE WHISTLEBLOWER REPORT told us about Mickey Esposito’s vow to return. Political Panhandling criticized Gannett Correspondent Anne Willette’s puff piece on freshman Congressman Charlie Luken and Michael Goegehegan claimed he didn’t know why he was fired as district audit manager of Ohio Auditor Thomas Ferguson’s Cincinnati Office. PAGE FIVE featured Bluegrass Holler by Ken Camboo, reporting that the City of Latonia Lakes was up for sale, Newport bar owners had announced price increases on everything from beer to couch dancing, not everybody approved of the new streetscape improvements on Monmouth Street, the Commonwealth Hilton was seeking a politician, and gubernatorial candidate Scotty Baesler was passing out sunflower seeds. J.R.HATFIELD was promoting “Condoms for Cons,” and local animal rights activists were planning protests at stores selling fur coats. 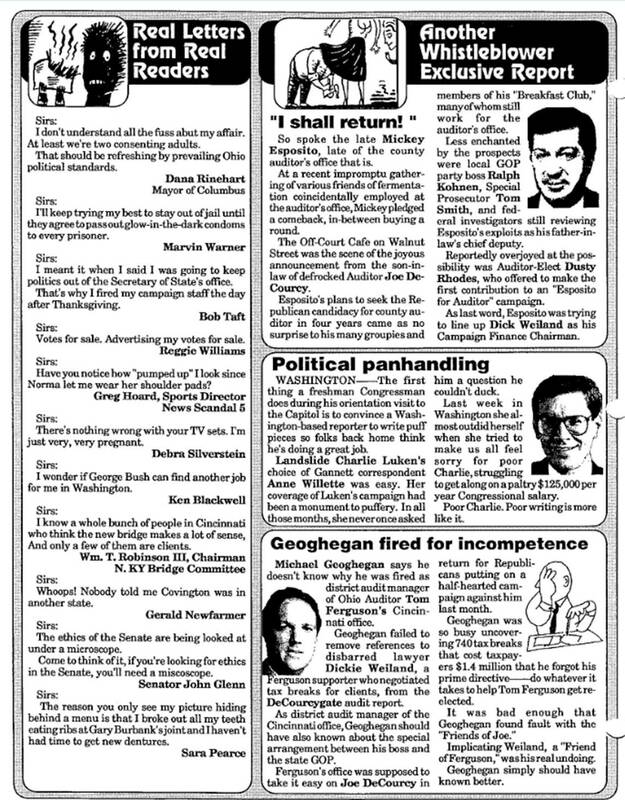 And PAGE SIX included SPOILED SPORTS By Andy Furman, told us about that classified ad he bought in the Enquirer urging Bengals Sam Wyche to get out of town, along with Thom Brennamann. The Seediest Kids of All featured Elroy Pudpuller, and Iraq Air was advertising a special price on flights to visit the hostages. 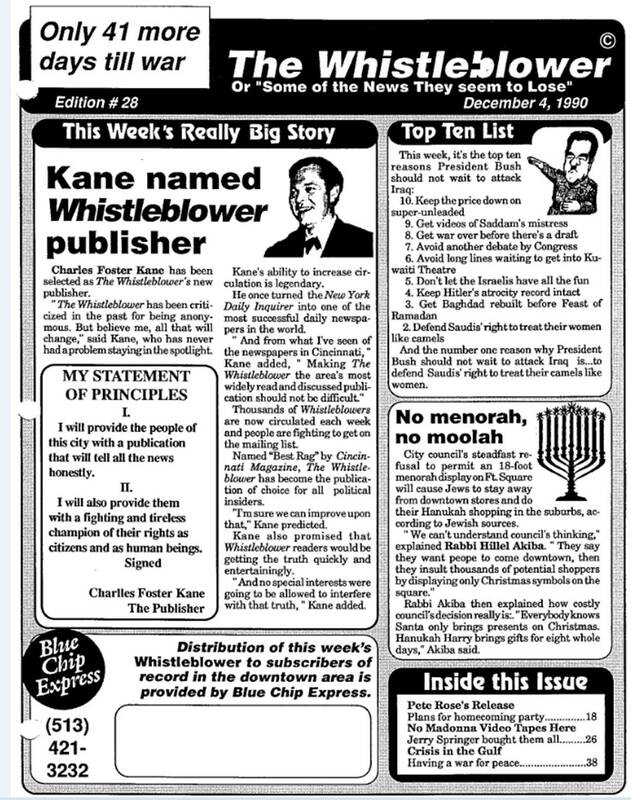 It was really a lot of fun publishing The Whistleblower way back in 1990. This entry was posted in Uncategorized and tagged Andy Furman, Charles Foster Kane named Publisher, Charlie Luken, Free Grain Party, J.R.HATFIELD, Jim Borgman, KEN CAMBOO, menorah, Mickey Esposito, Saddam, TOP TEN LIST on December 5, 2018 by charlesfosterkane.